Famed for its opulent Gilded Era mansions, shopping, and breathtaking coastal scenery, Newport is New England’s shining gem on the water. Whether you’re taking a stroll along the stunning Cliff Walk trail, visiting the homes of the Vanderbilts and Astors, exploring the city’s museums and Colonial landmarks, or browsing the quaint, charming shops of Thames Street, Newport offers the promise of a stress-free vacation in an ideal setting. And as the location of America’s very first shul, Newport holds special significance to American Jewry not only as a bastion of freedom from religious persecution, but also as the beginning of a rich culture that would profoundly shape the American social, political, and economic landscape from Colonial times right up to the present. One of America’s oldest cities, Newport was founded in 1639, just 19 years after the Mayflower landed at Plymouth Rock in 1620. The town’s first settlers came from Boston in order to found a new town free from political interference with their religious practices. Thus, Newport’s 1641 Town Charter enshrined the principles of religious and political freedom, as well as diversity and tolerance – a prototype for the future America. Many Jews and Quakers, frequent victims of religious discrimination by Colonial authorities, flocked to Newport and made the small agricultural settlement a bustling trade port on the Atlantic coast. By the 18th century, the majority of the town’s inhabitants were Quakers and their culture heavily influenced Newport’s architecture, arts, politics, economics, and social life. Thanks to the trade of fish, fine goods such as silver and furniture, and, unfortunately, slaves, Newport became an economic powerhouse in the mid 18th century, joining the likes of Boston, New York, and Philadelphia as one of Colonial America’s leading port cities. Along with other booming cities, Newport’s allegiances before and during the Revolutionary War lay firmly on the side of the Patriots, in large part due to the burdensome taxes levied by the British Colonial administration. In fact, Newport became such a hotbed of Patriot activity that British soldiers occupied the town from 1776 to 1779, causing much of the population to flee and the economy to lag. After the war, Newport struggled to recover its former glory. The city was able to get back on its feet in the early 19th century by becoming a haven for artists and intellectuals. At the end of that century, Newport gained its reputation as a “playground for the wealthy” as many aristocratic families build vacation homes there. Newport’s popularity is in large part due to the mansions, but also its fishing industry, Naval base, and yacht clubs, among other things. Newport today remains a thriving, vibrant city that prides itself on its diversity, history, and scenic landscapes. Touro Synagogue: Built in 1763, this is the oldest shul in the U.S. The congregation itself dates back to 1658 when the descendants of Sephardic Jews, who had fled the Inquisition in Spain and Portugal, themselves fled from the Caribbean in search of greater religious freedom. As the Jewish population of Newport continued to grow, it was finally decided in 1758 that a shul should be built for the community. Peter Harrison, a local British-American merchant and architect, graciously volunteered to lay out the shul’s design. His design, possibly inspired by those of shuls in New York and the Dutch island of Curacao, made the Touro Synagogue one of the most beautiful in America. It was spared by the British during the Revolutionary War as they turned it into a hospital and meeting house. Famously, George Washington wrote a letter to the then-president of Congregation Yeshuat Israel, Moses Seixas, in which he defended religious freedom and expressed good tidings to the Jewish people. The letter is ceremonially recited there once every year, often with dignitaries such as Supreme Court justices and university presidents in attendance. The shul owes its name to Isaac Touro, a Jewish immigrant from Holland, who served as the congregation’s first chazzan and who advised Harrison on the shul’s interior design. Touro Synagogue became a National Historic Site in 1946. Congregation Yeshuat Israel is still active and gladly welcomes visitors who wish to daven and/or tour. Tours are $12 for adults, $10 for seniors, $8 for students, and free for children 13 and under. The Breakers: Arguably Newport’s most famous and grandest mansion, The Breakers is a 70-room architectural masterpiece, incorporating the most dazzling artistic elements of the Italian Renaissance. When Cornelius Vanderbilt II, President of the New York Central Railway company, purchased the house in 1885 as his summer home, it was nothing more than a simple wooden building. That changed after he commissioned architect Richard Morris Hunt to design a grand palace that would match, or even exceed, those of the wealthiest European aristocrats. The interior is virtually the same as it was when the Vanderbilt family occupied the mansion. Highlights include the extravagant foyer, the library, music room, and the 2nd-floor bedrooms. When you exit out the rear of the building, you’ll be met with an impressive view of the ocean. Just near the mansion is the stable and carriage house where visitors can see the original carriages that were used by the staff to run Mrs. Vanderbilt’s errands. Admission to The Breakers only is $19.50 for adults and $5.50 for youth, but you can also purchase a bundle pack to see The Breakers plus another mansion, or 5 mansions including The Breakers. Marble House: Cornelius Vanderbilt’s brother, William, constructed his own summer home in Newport during the period of 1888-92. Marble House was as given to William Vanderbilt’s wife, Alva, as a 39th birthday present. Alva envisioned the house an American “temple to the arts.” Thanks to the $11 million supplied by Mr. Vanderbilt ($7 million of which was spent on 500,000 cubic feet of marble) as well as Alva and architect Richard Morris Hunt’s collective vision, the Marble House became one of the most opulent mansions in the world. The main inspiration for the house’s design came from the Petit Trianon at Versailles in France. The array of architectural styles Marble House incorporates is staggering. From the Louis XIV style Grand Salon to the Rococo style Library to the Gothic Room, displaying the Vanderbilts’ collection of medieval and Renaissance decorative pieces, Marble House is the epitome of Gilded Age luxury. After William Vanderbilt’s death, Alva remarried to Oliver H.P. Belmont and had a beautiful Chinese Tea House built right on the cliffside where she would host parties and rallies for women’s right to vote. The Elms: Another “summer cottage” for the wealthy elite, The Elms, built in 1901, served as the residence for coal baron Edward Julius Berwind. The mansion’s design is based on that of Chateau d’Asnieres, a mid-18th century French chateau. The art collection includes beautiful 18th century French and Venetian paintings, as well as exquisite Oriental jade. The mansion is smaller compared to The Breakers and Marble House, but that’s no reason to miss out on it. The grounds alone are some of the most impressive of the Newport mansions. From a marble and bronze sculpture park to elegant fountains to meticulously designed gardens to a carriage house and horse stables, The Elms’ exterior perfectly complements the palatial interior. In addition to a tour of the house’s main floors, you can opt to descend to the basement and see what life was like for the servants. Rosecliff: This “H” shaped, Versailles influenced mansion was built between 1898 and 1902 by Nevada silver heiress Theresa Oelrichs and her husband Hermann, an agent for a steamship line. The Oelrichs hosted many lavish parties in the Louis XIV style ballroom, including one which featured magician Harry Houdini. Rosecliff has also served as a prime filming location for movies such as The Great Gatsby, True Lies, and Amistad. Those who don’t find the extreme ostentatiousness of The Breakers or Marble House to their liking will find Rosecliff’s relatively simpler, less gaudy layout a welcome alternative. Chateau-sur-Mer: The subtle luxury of this Victorian mansion stands in marked contrast to the bold flashiness of its French counterparts in Newport. Built in 1852 for China trade merchant William Wetmore, the Chateau-sur-Mer was often the scene of socialite parties in its massive Grand Hall. After William’s death in 1862, his son George inherited the family fortune and had Richard Morris Hunt remodel the house in the Victorian style we see today. Unlike the seasonal mansions of Newport, this one was intended for year-round residence. Other mansions: Kingscote, Chepstow, Beechwood, and Belcourt Castle, among others, are also well worth your time. Colony House: The fourth oldest statehouse still standing in the U.S., Colony House was built in the 1730‘s in the English Georgian style and is the site of many important events that led to the creation of the United States. Some of these include the announcement of the death of King George II and the ascension of King George III in 1761, the celebration of the repeal of the Stamp Act in 1766, and the reading of the Declaration of Independence from the balcony on July 20, 1776. The house’s Great Hall hosted a banquet given by French General Rochambeau in honor of Washington’s victory. 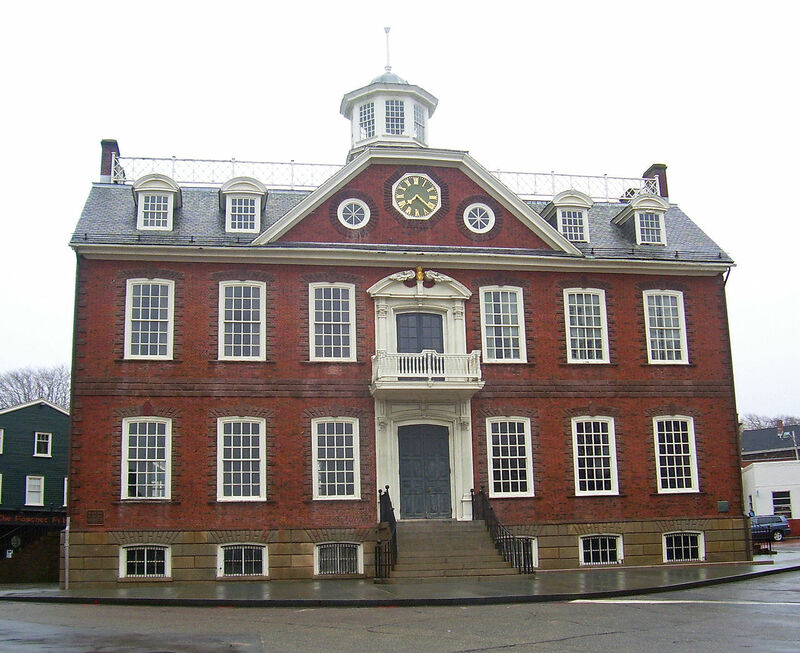 It served as Rhode Island’s main state house from 1739 to 1901, when it was converted to a courthouse. Colony House became a National Historic Landmark in 1962. Naval War College Museum: Though small, this museum provides excellent insight into the naval heritage of Narragansett Bay from Colonial times to the present. Among other things, you can learn about how the first torpedoes were made and how the War College worked as a think-tank for naval strategy. There are also vintage Navy recruitment posters. Admission is free. National Museum of American Illustration: This beautiful museum, set in the Vernon Court mansion, features over 2,000 pieces of illustration from such names as Norman Rockwell and Maxfield Parrish. The art and architecture complement each other to make for what’s undoubtedly one of America’s finest art galleries. Admission is $18 for adults, $12 for students, $8 for children 5 to 12 (children under 5 not admitted), and $16 for seniors. Thames Street: The heart of the downtown shopping district, Thames Street has many charming shops selling art, jewelry, clothing, antiques and more. The shops are a bit pricey, but Thames Street is still the perfect place for souvenirs, or even just a stroll along the boardwalk. The street is also one of the oldest in America and was one of Newport’s two original streets when its plans were laid out in 1654. Besides shops, you can see historic houses and stay in one of the many cozy bed-and-breakfasts. Outdoor activities: Newport boasts some of America’s most beautiful coastline scenery and has plenty of fun activities to match. The most popular is the Cliff Walk hike from which you can see famous mansions, rocky causeways, fishermen, and, of course, spectacular sunsets. Fort Adams State Park offers a free tour of Fort Adams, a late 18th century coastal fortification that was in use up to 1953. The park offers great views of the harbor and Narragansett Bay, as well as hosting the Newport Jazz and Folk Festivals. The park is also home to Dwight Eisenhower’s summer house. Newport also has two picturesque lighthouses. One is Castle Hill Lighthouse which sits atop a hill overlooking the ocean and nearby Pell Bridge. The other, Rose Island Lighthouse, is a bit harder to get to as it’s located on Rose Island, but it’s well worth the trip. In addition to its beautiful architecture and serene location, you can step inside it and view the museum or even stay a night as a keeper. Outdoor sports in Newport include fishing, sailing, jet skiing, kayaking, scuba diving, surfing, and skydiving. One of the most popular activities is taking a cruise on Gansett Cruises’ restored wooden yacht. The cruise goes along the coast and offers great views of mansions, lighthouses, and other boats. There is also a tour guide on board to inform you about the history, people, and wildlife of the Narragansett Bay. Adults are $26, children 4-12 $20, and seniors $24. Cruises are not offered in the winter. The Admiral Weaver Inn bed-and-breakfast is a popular place of lodging for frum visitors. It provides a limited selection of kosher food in-house as well as kosher catering (though at a considerable cost). A Shabbos blech is provided. Kosher food is also available from Newport’s various supermarkets. The closest airport is T.F. Green which serves Warwick, Rhode Island. From there, it’s 35 minuted to Newport. Flights start around $360 per person. By car, the city accessible via three bridges: Pell, Mount Hope, and Sakonnet. Driving from L.A. to Newport takes at least 4 days and crosses a distance of about 3,000 miles. Greyhound bus service is available at a price of about $260 per person round trip.